Exhibits Earnest Money Escrow Instructions, a Documents List of materials concerning the property, an Estoppel Certificate for the Third Party Tenants in the Property, an Assignment and Assumption Agreement of Leases Agreement, an Assignment and Assumption of Intangibles Agreement, and a Bill of Sale for Personal Property. THIS AGREEMENT OF PURCHASE AND SALE (this "Agreement") is made and entered into as of this ____ day of _______, 20__ (the "Contract Date") by and between INDUSTRIAL PROPERTY OWNER, INC., a ________ corporation ("Seller"), and INDUSTRIAL PROPERTY PURCHASER, INC., a ________ corporation ("Purchaser"). (d) to the extent transferable, all of Seller’s right, title and interest (if any) in and to all intangible assets of any nature relating to any or all of the Land and the Improvements, including, but not limited to, (i) all guaranties and warranties issued with respect to the Improvements; (ii) all plans and specifications, drawings and prints describing the Improvements; (iii) trademarks or trade names associated with the Improvements; and (iv) all licenses, permits, approvals, certificates of occupancy, dedications, subdivision maps and entitlements now or hereafter issued, approved or granted by any governmental authority in connection with the Land or the Improvements (collectively, the "Intangibles"). The Land, the Improvements, the Leases and the Intangibles are hereinafter referred to collectively as the "Property." The total purchase price to be paid to Seller by Purchaser for the Property shall be ______________________ DOLLARS ($_________) (the "Purchase Price"), plus or minus prorations as hereinafter provided. The purchase and sale contemplated herein shall be consummated at a closing ("Closing") to take place by mail or at the offices of the Title Company (defined below). The Closing shall occur on or before the date that is five (5) business days after the Approval Date (the "Closing Date"). Simultaneously with the execution and delivery of this Agreement by Purchaser and Seller, Purchaser shall deposit, as its initial earnest money deposit, the sum of One Hundred Thousand and No/100 Dollars ($100,000.00) (the "Initial Earnest Money") in an escrow with the Title Company (the "Escrow") pursuant to escrow instructions in the form attached hereto as Exhibit B. Purchaser shall deposit the sum of One Hundred Thousand and No/100 Dollars ($100,000.00) (the "Additional Earnest Money") as its additional earnest money in escrow with Title Company immediately upon the expiration of the Approval Date (as defined in Section 6.1). The Initial Earnest Money, the Additional Earnest Money and all interest earned thereon are herein collectively referred to as the "Deposit." Except as otherwise expressly set forth herein, the Deposit shall be applied against the Purchase Price at Closing. Prior to the execution of this Agreement, Seller has, to Seller’s knowledge, delivered or made available to Purchaser, or within five days after execution of this Agreement Seller shall, to Seller’s knowledge, deliver or make available to Purchaser, all of the documents and agreements described on Exhibit C attached hereto and made a part hereof that are in Seller’s possession (the "Documents"). From the date hereof until the Closing Date, Seller shall continue to make available to Purchaser or its agents for inspection, all, to Seller’s knowledge, of the Documents in Seller’s possession. The Documents that are furnished or made available to Purchaser pursuant to this Section 5 are being furnished or made available to Purchaser for information purposes only and without any representation or warranty by Seller with respect thereto, express or implied, except as may otherwise be expressly set forth in this Section 5 or Section 8.1 below, in either case as limited by Sections 8.2 and 8.3 below. 6.1 Basic Project Inspection. At all times prior to Closing, including times following the "Inspection Period" (which Inspection Period is defined to be the period commencing on the Contract Date and continuing through and including _______, 20__), Purchaser and Purchaser’s employees, third party consultants, lenders, engineers, accountants and attorneys (collectively, the "Purchaser’s Representatives") shall be entitled to conduct a "Basic Project Inspection" of the Property, which will include the rights to: (i) enter upon the Land and Improvements, at reasonable times, to perform inspections and tests of the Land and the Improvements, (ii) make investigations with regard to the environmental condition of the Land and the Improvements and the compliance by the Land and the Improvements with all applicable laws, ordinances, rules and regulations, (iii) review the Leases affecting the Property, and (iv) interview any tenant at the Improvements with respect to its current and prospective occupancy of the Improvements as long as a representative of Seller is in attendance throughout such interview, which representatives shall be made reasonably available for such purposes. Purchaser shall provide not less than two (2) business days’ prior notice to Seller before conducting any investigations, study, interview or test to or at the Land and the Improvements. If Purchaser determines that the results of any inspection, test, examination or review do not meet Purchaser’s criteria (which criteria may include the requirements of Purchaser’s lenders and investors), in its sole discretion, for the purchase, financing or operation of the Property in the manner contemplated by Purchaser, then Purchaser may terminate this Agreement. This Agreement shall automatically terminate unless Purchaser provides Seller with written notice waiving Purchaser’s right to terminate this Agreement pursuant to this Section 6.1 prior to the of the Inspection Period (the "Approval Date"). If this Agreement terminates pursuant to the foregoing provisions of this paragraph, then neither party shall have any further liabilities or obligations hereunder, except for those liabilities and obligations that expressly survive a termination of this Agreement and the Deposit shall be returned to Purchaser. 6.2 Purchaser’s Undertaking. 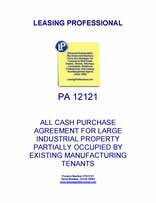 Purchaser hereby covenants and agrees that it shall cause all studies, investigations and inspections performed at the Land or the Improvements to be performed in a manner that does not unreasonably disturb or disrupt the tenancies or business operations of the tenant(s) at the Improvements. Purchaser shall not conduct (or cause to be conducted) any physically intrusive investigation, examination or study of the Land or the Improvements (any such investigation, examination or study, an "Intrusive Investigation") as part of its Basic Project Inspection or otherwise without the prior written consent of Seller, which consent shall not be unreasonably withheld. Purchaser and Purchaser’s Representatives shall, in performing its Basic Project Inspection, comply with any and all applicable laws, ordinances, rules, and regulations. Except to the extent required by any applicable statute, law, regulation or governmental authority in its capacity as a contract purchaser (i.e. not an owner), neither Purchaser nor Purchaser’s Representatives shall report the results of the Basic Project Inspection or any Intrusive Investigation to any governmental or quasi-governmental authority under any circumstances without obtaining Seller’s express written consent, which consent may be withheld in Seller’s sole discretion. If this transaction fails to close for any reason other than due to Seller’s default, Purchaser shall provide Seller with copies of any and all final, third party reports prepared on behalf of Purchaser as part of the Basic Project Inspection without any representation or warranty regarding the accuracy thereof. Purchaser and Purchaser’s Representatives shall: (a) maintain comprehensive general liability (occurrence) insurance in an amount of not less than $2,000,000 covering any accident arising in connection with the presence of Purchaser and Purchaser’s Representatives at the Land and the Improvements while performing any investigations, examinations or studies thereon, and shall deliver a certificate of insurance (in form and substance reasonably satisfactory to Seller), naming Seller as an additional insured thereunder, verifying the existence of such coverage to Seller prior to entry upon the Land or the Improvements; and (b) promptly pay when due any third party costs associated with its Basic Project Inspection. Purchaser shall, at Purchaser’s sole cost, repair any damage to the Land or the Improvements resulting from the Basic Project Inspection or any Intrusive Investigation, and, to the extent Purchaser or Purchaser’s Representatives alter, modify, disturb or change the condition of the Land or the Improvements as part of the Basic Project Inspection, any Intrusive investigation or otherwise, Purchaser shall, at Purchaser’s sole cost, restore the Land and the Improvements to the condition in which the same were found before such alteration, modification, disturbance or change. Purchaser hereby indemnifies, protects, defends and holds Seller, Seller’s affiliates, their respective partners, shareholders, officers and directors, and all of their respective successors and assigns (collectively, the "Seller Indemnified Parties") harmless from and against any and all losses, damages, claims, causes of action, judgments, damages, costs and expenses (including reasonable attorneys’ fees and court costs) (collectively "Losses") that Seller or any Seller Indemnified Party suffers or incurs as a result of, or in connection with Purchaser’s Basic Project Inspection, any Intrusive Investigation or Purchaser’s or Purchaser’s Representatives entry upon the Land or the Improvements hereunder. Purchaser’s undertakings pursuant to this Section 6.2 shall indefinitely survive a termination of this Agreement or the Closing and shall not be merged into any instrument of conveyance delivered at Closing. 6.3 Confidentiality. Purchaser agrees to use reasonable efforts to maintain in confidence the information and terms contained in the Evaluation Materials (defined below) and this Agreement (collectively, the "Transaction Information"). Purchaser shall not disclose all or any portion of the Transaction Information to any person or entity and shall maintain the Transaction Information in the strictest confidence; provided, however, that Purchaser may disclose the Transaction Information: (a) to Purchaser’s Representatives to the extent that Purchaser’s Representatives reasonably need to know such Transaction Information in order to assist, and perform services on behalf of, Purchaser; (b) on not less than two (2) business days prior written notice, to the extent required by any applicable statute, law, regulation or governmental authority; (c) in connection with any litigation that may arise between the parties in connection with the transactions contemplated by this Agreement; and (d) to the extent that any Transaction Information is generally available to the public through other sources. Purchaser shall advise Purchaser’s Representatives of the provisions of this Section 6.3 and cause such parties to maintain the Transaction Information as confidential information and otherwise comply with the terms of this Section 6.3. For purposes of this Agreement, the term "Evaluation Materials" shall mean the Documents and any other materials or information delivered or made available by Seller or its agents to Purchaser or Purchaser’s Representatives together with (i) all analyses, compilations, studies or other documents prepared by (or on behalf of) Purchaser, which contain or otherwise reflect such information or materials and (ii) the results of any studies, analysis or investigation of the Property undertaken by or on behalf of Purchaser. Purchaser agrees that the Evaluation Materials shall be used solely for purposes of evaluating the acquisition and potential ownership and operation of the Property. Notwithstanding anything contained herein to the contrary, it is understood and agreed that money damages would not be a sufficient remedy for any breach of this Section 6.3 by Purchaser or Purchaser’s Representatives and that Seller shall be entitled to specific performance and injunctive or other equitable relief as a remedy for any such breach of this Section 6.3 by Purchaser or Purchaser’s Representatives. Purchaser further agrees to waive any requirement for the security or posting of any bond in connection with such remedy. Such remedy shall not be deemed to be the exclusive remedy for breach of this Section 6.3 but shall be in addition to all other remedies available at law or in equity to Seller. In the event this Agreement is terminated for any reason whatsoever, Purchaser shall promptly (and in any event within three (3) business days after the effective date of termination) return to Seller the Documents and any and all copies of the Documents and destroy any and all other Evaluation Materials. The undertakings of Purchaser pursuant to this Section 6.3 shall survive the termination of this Agreement. 6.4 Seller’s Covenants. During the Inspection Period and until the Closing Date, Seller shall, at no additional third party cost or expense to Seller, reasonably cooperate with Purchaser in Purchaser’s efforts to obtain any permits, approvals, reviews, title insurance, or inspections by governmental agencies that Purchaser are required to obtain during the Inspection Period and shall, as owner of the Property, execute reasonable documents that are reasonably necessary to obtain such matters.